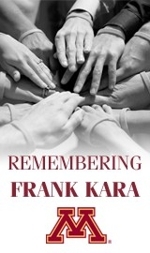 The University of Minnesota Athletic Department and the Office of General Council established the Frank Kara Integrity Award to honor his legacy. The award will honor an individual annually involved with University of Minnesota athletics who demonstrates the integrity in athletics that were characteristic of Frank during his time as director. The purpose of the award is to identify and reward acts of integrity and to encourage a culture of compliance that is intended to be one of the hallmarks of University of Minnesota Athletics. The compliance office in the Bierman Athletic Building was also renamed is honor in September 2007.